In addition to the normal collection of waste, your local authority may also offer special collection services for bulky household goods which can be recycled or reused. 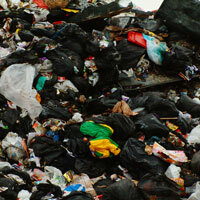 Some local authorities also offer commercial waste collection services to businesses and other institution. There is normally a charge for such services. As each local authority is different in how and when it collects waste, it is important that you contact your authority to find the collection services that apply in your area. You can find further information on the collection services provided by local authorities across the country by clicking on the Related Links (in the box on the right of this page). Local authorities are now required to meet higher recycling and composting targets under current EU and UK laws and would be penalised if they fail to meet these targets. This has led to changes in the way that local authorities collect waste. These changes are designed to increase the level of household recycling and composting, thereby reducing the amount of waste incinerated or thrown into landfills. To achieve these targets, some local authorities now offer households two wheelie bins. One is meant for general waste and the other for recycling. (Check for availability in your area). Many authorities also provide compost bags for organic waste such as grass and hedge cuttings. Animal By-Products Regulations in the different regions of the UK require that kitchen (food) waste must be composted and processed in a temperature controlled and covered environment. Local authorities who do not currently provide this service recommend that you compost food waste at home or place it with other non-recyclable general refuse. Check your local authority to see if it offers subsidised home composting bins. Under the WEEE Regulations, local authorities may have to adjust their collection systems to receive waste electrical and electronic goods (WEEE). Under the Regulations, it is expected that the financial costs for this adjustment would be borne by the producers and distributors of electrical and electronic goods. Shops that sell more than 32kg of batteries a year must accept old batteries for recycling. Many of theses shops will now have battery collection points in their store. The collection points are often highlighted by a Be Positive sign. Some Local Authorities also collect batteries as part of their doorstep recycling scheme (check your Local Authority for details). Batteries from the following household items can be recycled: mobile phones, laptops, portable cameras, electric toothbrushes and electric razors.